McKee's 37 Krystal Vision Glass Kit Best Seller! Visualize perfectly clear automotive glass with the McKee's 37 Krystal Vision Glass Kit ! The McKee's 37 contains the most effective auto glass products on the market. Each product is proven to restore cloudy, spotted glass and maintain the clarity of your windshield and windows, rain or shine. This is proven glass care technology available only from McKee's 37! If you’ve ever researched auto glass restoration, you probably didn’t get too far. Many detailers, both hobbyists and professionals, will tell you there’s absolutely nothing you can do for mineral-etched, cloudy glass. The fact is, you can correct many glass imperfections with the McKee's 37 Krystal Vision Glass Kit. Simply put, this kit includes some of the best glass care products in the detailing industry and household cleaning industry, bar none. 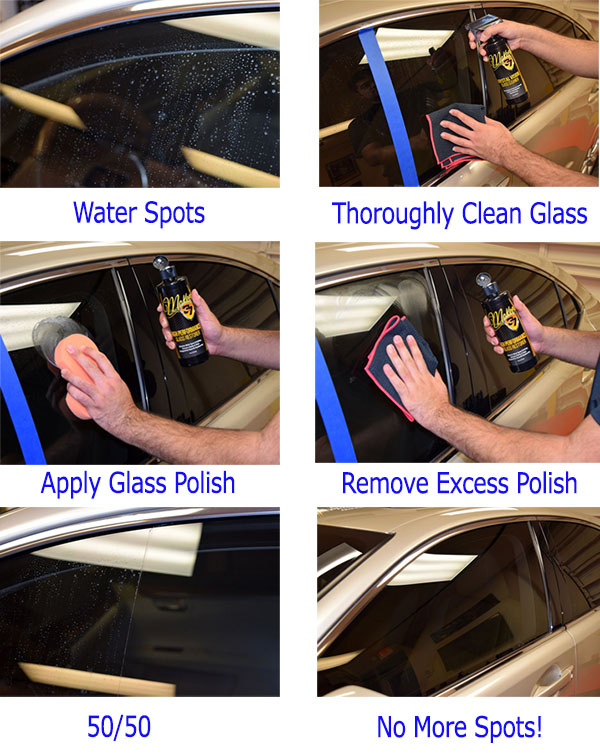 The McKee's 37 Krystal Vision Glass Kit is a complete solution to spotted, dirty, cloudy automotive glass. You don’t need a polisher and there’s no risk of making waves in the glass with these products. The McKee's 37 Krystal Vision Glass Kit is safe and effective at removing common auto glass imperfections and restoring the clear, virtually invisible appearance of your vehicle’s glass. Water spots are rough minerals deposits left on your vehicle after rain or water evaporates. Often, water spots are the result of iron deposits left by sprinklers. If not removed, water spots layer on top of each other to create cloudy patches on glass and automotive paint. You’ll notice a distinct outline on your windshield where the wipes do not reach: this is the result of mineral deposits. Gradually, the minerals etch the glass to make water spots a permanent feature on your windshield. McKee's 37 High Performance Glass Restorer actually removes etched water spots and salt spray spots from glass and restores perfect clarity. The glass polish works by gently exfoliating the surface of the glass on a microscopic level. It does not scratch the glass. The thick cream safely pulls contaminants out of the glass, including mineral deposits, and then smoothes out etched glass until it is crystal clear. It safely restores the glass in the same way jewelers rouge polishes precious metals. Your vehicle’s windshield and windows will appear virtually invisible. I’m not talking about the latest detective movie; I’m talking about the film that appears on your windshield for no apparent reason. This film tends to smear with most glass cleaners and it impairs your ability to see the road, especially when it rains. Films are often a combination of oil, vehicle exhaust and airborne pollution. It takes a powerful glass cleaner to cut through this mess. Mystery solved. McKee's 37 Krystal Vision cuts through oily films, even smoker’s film, to reveal clean, streak-free glass. This is a whole new approach to glass cleaning. Instead of alcohol or ammonia, McKee's 37 Krystal Vision Glass Cleaner contains non-ionic surfactants. These specialized molecules are non-reactive and nontoxic. They encapsulate oil and dirt and suspend it in the water-based emulsion. When you wipe away the wetness, you wipe away the dirt. Amazingly, McKee's 37 Krystal Vision Glass Cleaner leaves no streaks or residue. This ammonia-free glass cleaner is safe on window tint. With over 220,000 silky fine threads per square inch, the new towel is still super soft with unparalleled absorbency and durability.The superior capacity for moisture eliminates glass streaks better than any other towel. A double-stitched edge and a plush waffle weave round out the features of our best glass cleaning towel to date. Used with any cleaner, the Microfiber Glass Towel is impressive, but it really shines when used with McKee's 37 Krystal Vision Glass Cleaner. The Orange Foam Cutting Applicator is designed to remove water spots and other contaminants from glass when used in conjunction with our High Performance Glass Restorer. Its ergonomic design is easy to hold on to. The McKee's 37 Krystal Vision Glass Kit is your solution to spotted, cloudy, bumpy glass. We believe this the best collection of auto glass products you can buy for any price. While there are other glass polishes and cleaners on the market, none are as safe and effective as McKee's 37 glass products. We guarantee that the products in the McKee's 37 Krystal Vision Glass Kit will result in perfectly clear glass. Restore your vehicle’s glass to showroom perfection with the McKee's 37 Krystal Vision Glass Kit! McKee's 37 High Performance Glass Restorer can be applied by hand or with a polisher. To apply by hand, pour a nickel size amount onto the orange side of the Orange Foam Cutting Applicator Pad. Rub the product onto the glass in overlapping circular motions. Allow a haze to form. Buff the glass with a microfiber towel. To apply by machine, use a polishing pad on a variable speed dual action polisher. You can also use a Spot Buffs white pad on your electric drill. See the Spot Buffs page for more information. Work the polish into the glass at a low speed (no more than 3000 OPM) using minimal pressure. When the polish starts to dry, turn the machine off and lift it off the glass. Use a microfiber towel to wipe away the haze and buff the glass to a shine. For regular cleaning, mist the glass with McKee's 37 Krystal Vision Glass Cleaner. Wipe the glass with long strokes using your folded Microfiber Waffle Weave Glass Towel. Wipe first side to side and then top to bottom. Flip the towel to a dry side and give the glass a final wipe to eliminate streaks. A total retail value of $49.95, Save $9.96! McKee's 37 Total Glass Care Kit Free Bonus! No more water spots. 5 We bought a used Escape a couple of years ago. The windows had heavy water spotting on them. I used another brand glass polish a few times and it worked okay. I came across this glass cleaning kit and gave it a try. The glass cleaner does a good job with the initial dirt on the window. What I really liked was the glass restorer. It took care of the water spots on all of the exterior glass and I finally got rid of some type of film on the back hatch glass. The tip Nick gives about giving the glass a quick spray of cleaner before the final wipe in the video helped out. I always thought you wanted to use a completely dry towel to dry the windows. Tried it and now it's one extra step I have added. Pros:Did what another brand couldn't do. Best glass cleaner and restorer I used 4 Hard water is an issue here and it stains everything. Not only does it work on auto glass it's worls on glass showers as well. Sparkling Shower Doors 5 I ordered the glass cleaner along with the wax. I was a little skeptical because nothing I used before worked. The smudge marks are gone and now I am looking through glistening glass. great stuff 5 works very easy. Awesome! 5 Removed water spots and etching easily...by hand application!! Cons:I had hoped it would polish out scratches...it did not. McKee's 37 Krystal Vision Glass Cleaner 128 oz. Free 32 oz. Spray Bottle!